I believe that every SiteCatalyst implementation should have a Previous Page sProp. There! I said it (I feel like I am channeling Avinash!). In past blog posts I have touched upon the use of a Previous Page sProp, but I feel like I have not done it justice and wanted to take time to explain it in greater detail. In this post, I will describe why I think this variable should always be set and provide some examples of its use. 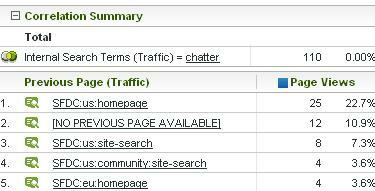 As you can see here, we see the same “4” searches for the phrase “chatter” from the selected page as we saw in the first internal search term report (in this case I am just using Internal Search as an example, but if you want to learn more check out my Internal Search post). However, one word of caution, I have seen many clients implement several Previous Page sProps and I am not a fan of doing this as I will now explain. 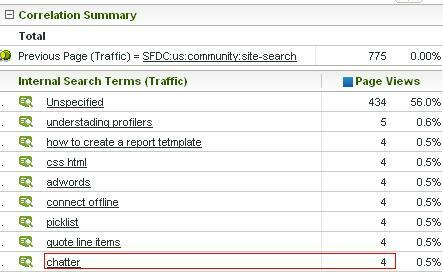 Let’s say you want to see what page people were on when the searched on a specific search term (as described above) and you also want to see what page they were on when the downloaded files on your site. A lot of people will set two Previous Page sProps in this situation – one for the search term and one for the file downloads. In my opinion, this just wastes a variable, wastes correlations and causes confusion for your users. The truth is that all you need is one Previous Page sProp to answer both questions. Since on each page there will be one and only one Previous Page value, there is really no reason to do this multiple times. I have seen some clients who have chosen to pass the Previous Page Name to an eVar. There are some interesting uses of this. For example, if you want to see what pages visitors were on when they added a specific product to the shopping cart, you can pass the Product Name to the Products Variable, set the Cart Add Success Event and the Previous Page Name to an eVar. The main issue you will run into is that Conversion Subrelations are an “all or nothing” proposition so you can only do breakdowns by eVars that have Full Subrelations. One final tip that I will throw out there is to consider having your developer pass a value of “[NO PREVIOUS PAGE AVAILABLE]” (or something similar) to the Previous Page sProp on entry pages (or any other time no Previous Page is available). I find that this is easier than dealing with questions around “Unspecified” in correlation reports and it is easier to remove this value using the search box than it is to hide the “Unspecified” values. I never considered passing the previous page name to an evar, I think it will be of great use. I’d also like to capture the overall use of add to carts from pages other than the pdp, not necessarily specific products. Is this as simple as setting another event along with scadd? My site has 2 page where add to cart is possible, so it would only take 2 events. I always enjoy the posts, keep em coming! how does this work with DTM? Also, how can yo do this in App? is tehre a feature in the SDK?